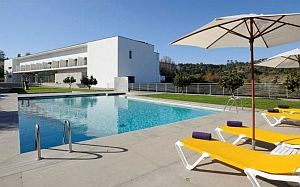 Arraiolos is directly east of Lisbon and dates back to the 14th century. A very picturesque town, it was built on a hilltop with lovely views of the river below and houses nestled in the hillside. Part of its charm is the fact there are only 3,000 residents which means it has more of a village feel about it; warm, welcoming and friendly. Arraiolos itself dates back to the 2nd century and is almost like stepping back in time. One of the first places you should head for is the Praca Lima e Brito in the centre of town. The square is where many of the locals gather throughout the day, and where you will find most of the bars and street cafes. If you wish to sample some of the local cuisine, one of the best places to visit is the local market where there are often food and wine festivals held. The Praca Lima e Brito is filled with historical buildings, and there is a dancing fountain which is quite a fascinating site to see. This is where you will also find the Pillory, and the Hospital do Espirito Santo with beautiful examples of azulejos (blue tiles). A pillory is like the old stocks; hinged wooden boards that have holes for the head and/or limbs and used to publicly humiliate petty criminals by subjecting them to the jeers and taunts of the town's people. The one in Arraiolos has been very well preserved and has pride of place in the square. It may be a small town but it is world famous for its production of exceptional rugs which the locals have been producing since the 6th century. They are all hand made using traditional methods which have barely changed over time. The rugs are made on a canvas frame, and although the original designs would have been more like the Persian rugs, all that changed in the 18th century. You can actually find examples of Arraiolos rugs in the Victoria and Albert Museum in London. Overlooking Arraiolos is a medieval castle that was built in the 14th century to protect the inhabitants of the town. Still in remarkable condition, the watch tower and clock tower still stand today with the original church in the centre of the castle grounds. Although at one stage the majority of the town was within the walls of the castle, this 16th century parish church is the last remaining building. Inside there are many beautiful pieces of artwork on display. Other examples of historical art can be seen in the local Council Building, which has paintings by the local artist Dordio Gomes as well as a fine collection of tapestries. 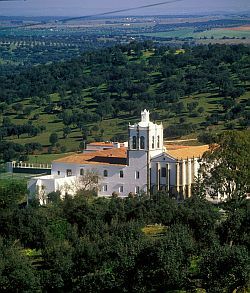 There used to be a convent in the town during the 16th century and this has now been converted into the Pousada de Arraiolos (Hotel Nossa Senhora da Assuncao). Combining the historical features of the convent with the standards of modern comfort, it is a marvelous setting. It has two shaded cloisters, a lovely garden, swimming pool, and tennis court, as well as a restaurant serving regional specialties. If you wish to explore the surrounding area, only 20km from Arraiolos is the World Heritage Site of Evora, an impressive fortified town filled with fine architectural examples of the Renaissance period. This is also an opportunity to visit a 2nd century Roman temple which is the best preserved in all of Portugal. Or there is the tiny village of Pavia where you will find a dolmen so large that a chapel was built inside of it during the 16th century. For those who enjoy outdoor pursuits, there are plenty of opportunities to go hiking and cycling. Or for the more adventurous, you can canoe, horseback ride, and take in the views as you fly over the countryside in a hot air balloon.